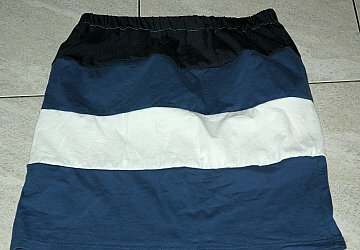 This tiered t-shirt skirt project came about after creating the page skirts made from t-shirts. I was asked how to create the t-shirt skirt with tiers for a teen or an adult so I've done some experimenting. There is a slight change in this skirt as we won't be gathering the layers making a more ruffled look as in the previous project. This will make the skirt easier to create for older teens and adults, whereas the tiered skirt on our other t-shirt skirt page works better for smaller sizes. 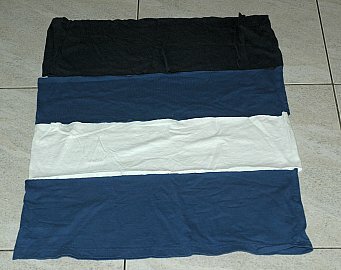 You will use 2-3 t-shirts of different colors that are all the same size preferably large or XL t-shirts. Next cut 3 or 4 strips. Depending on the length you'd like, add more strips if you'd like a longer skirt. Make your strips 7 or 8 inches wide. You can vary the widths if you would like. Leave the side edges in tact and just cut straight across. Leave one strip with the bottom hem intact to be the bottom hem of your skirt. Pin the bottom strip to the next strip, making sure to pin the side stitching together. Sew two strips together. On top edge of skirt turn edge 1/2 inch down and then 1 inch down. Pin along edge. Sew along edge leaving a 1 inch gap for inserting elastic. Insert elastic and sew securely. Sew 1 inch gap closed. Need a reminder on how to insert elastic? 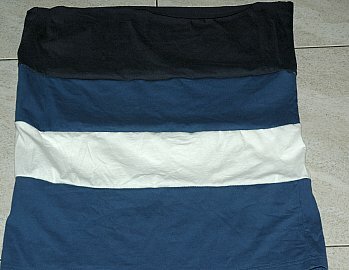 More t-shirt sewing projects from Tiered T-shirt Skirt.